Home College Radio Fund Coming Monday: Apply for station grants! Applications for grants for fall 2018 will open on Monday October 22nd for stations to apply. We are offering five (4) $1,000 station grants and one (1) $2,000 station grant. Deadline for applications is November 9, 2018. Recipients will be announced on January 16, 2019. 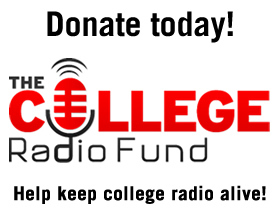 NextApply NOW for a College Radio Grant!